I never use floating selvedges. Well,…almost never. For this block twill it does make sense to “float” the selvedges. 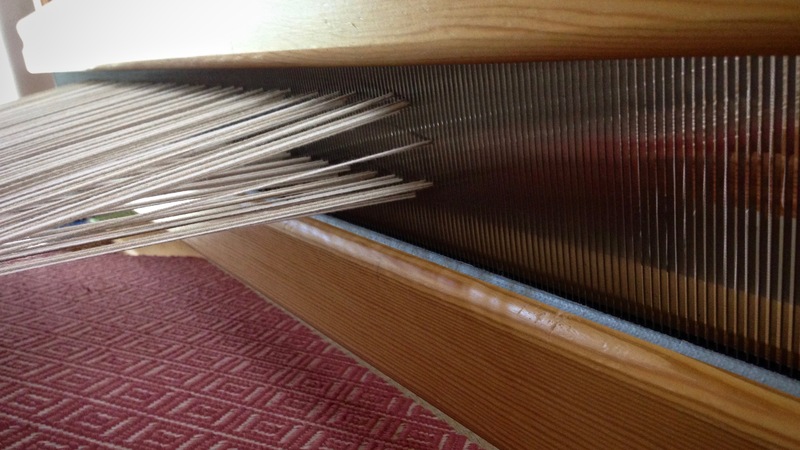 The outermost warp ends are not threaded in the heddles–they “float” in the middle of the shed. 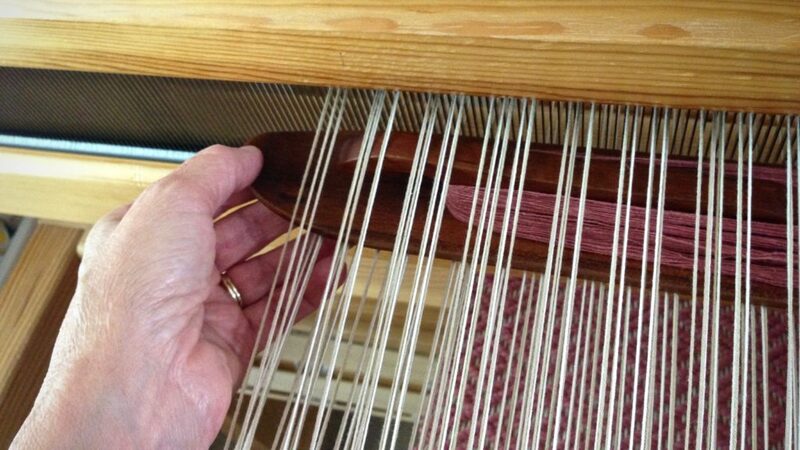 The floating ends are wound on to the back beam with the rest of the warp. The floating selvedges provide a consistent woven edge, and prevent the skipped threads that would normally occur at the selvedge on an eight-shaft block twill. My ski shuttle enters the shed under the floating warp end, and exits the shed over the opposite floating warp end. Outermost warp ends are not threaded through heddles. When a treadle is pushed, the floating selvedge threads do not go up or down with the other warp ends. Enter the shed under the floating selvedge. The curve of the ski shuttle easily slips under the floating selvedge. Prepare to catch the shuttle by holding the floating selvedge down with your fingers. After the tip of the ski shuttle has crossed over the floating selvedge, continue bringing the shuttle through. It is not unusual for the Lord to wait until I’m quiet before he answers. I may gripe about the obstacles, and try to wish or pray them away. But the Lord gently moves the shuttle under or over the floating selvedge to accomplish his work. For him, it is not an obstacle, it is a necessary part of creating this kind of cloth. When I get quiet, I can see what he is doing. And it is good. May you know when to be quiet. Hi Karen, Thanks for the post. I recently used a floating selvedge not wound onto the warp beam, but hanging over the back with a weight. That works better for me, because the tension stays more consistent over the length of the warp (as long as I do not forget to slide the weight down occasionally). Being able to beam it is a testimony to your expertise preparing your loom. I might get there one day. Hi Gerda, Since this is a relatively short warp, I don’t think I will run into tension problems with the floating selvedges, but if I do, I plan to hang S-hooks on those outer warp ends to add just a little tension. My mother used to tell me, “Never say what you won’t do. You’ll end up doing just that!” Boy has she been right. Julia, Your mother gave good advice! I am about to thread the heddles on some towels and the pamphlet with the patten says to use fishing line as my floating selvage. I am really hesitant to do this, wondering if it will make a loop at the edges when the line is removed. Maybe I will add in a floating selvage of the same warp thread and leave it there. Hi Donna, I have heard of the fishing line trick, but I’ve never tried it. I like having as little “fuss” as possible, so beaming the floating selvedges made sense to me. Like I mentioned to Gerda, if the floating selvedges become looser in tension I can always add a little weight to them. Thought I would speak up regarding the use of fishing line as a floating selvage. I use fishing line along with one selvage thread on all my weaving projects, except for plain weave. Beam the warp with the your normal floating selvages on each side. After the warp is beamed, threaded and tied on I add a fishing line selvages to each side. The fishing line is wound around a pill container and weighted with coins – it is hung off the back beam. After the weaving is complete and the project is cut from the loom I pull only the fishing line selvage from the sides. There are no loops and the selvages look beautiful. Great way to avoid using a wooden temple and still have a great selvage. Hi Martha, It’s great to hear of your experience using fishing line! I can see how that would give nice, straight selvedges. I’m a new weaver and was under the impression that FS are a “must” for some patterns, such as twill. But you do a lot of weaving and don’t use them, so I’m curious to know how you do it, or if you just use patterns that don’t need them? I’m currently getting ready to weave my third warp, and it’s my first time using floating selvedges. Any help would be appreciated! Thank you for asking! As you may have guessed, floating selvedges is a hot topic among weavers. Keep in mind that I have been taught in the Swedish tradition, where floating selvedges are not used as frequently as many handweavers in the USA use them. 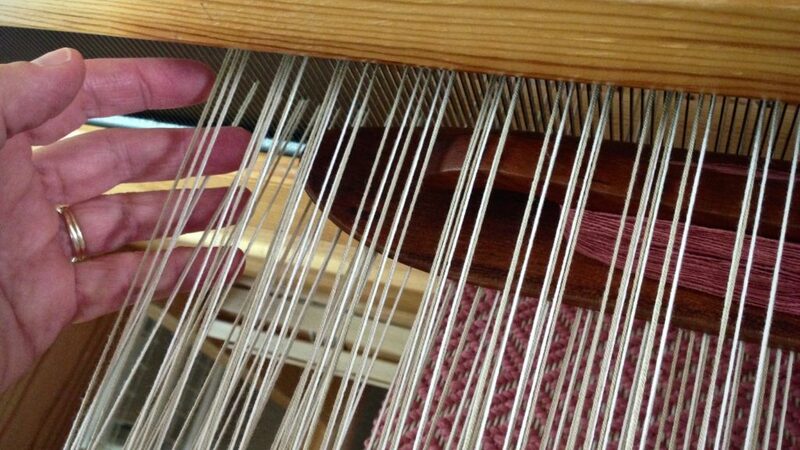 Some of my favorite handweavers never (or seldom) use floating selvedges. I like to follow their example when I can. I have found that floating selvedges are not usually necessary. In some weaves you will have a small float at places in the selvedge, but that just becomes part of the design and does not usually detract from the article. Often you can eliminate the float just by starting your shuttle from the opposite side. Goose-eye twill is a tricky one. I have done goose-eye without floating selvedges (because I forgot), and have done it with floating selvedges. I like the one without FS better. But that’s just me. I am not fond of hanging things off the back of my loom, so I will beam the FS if I use them. 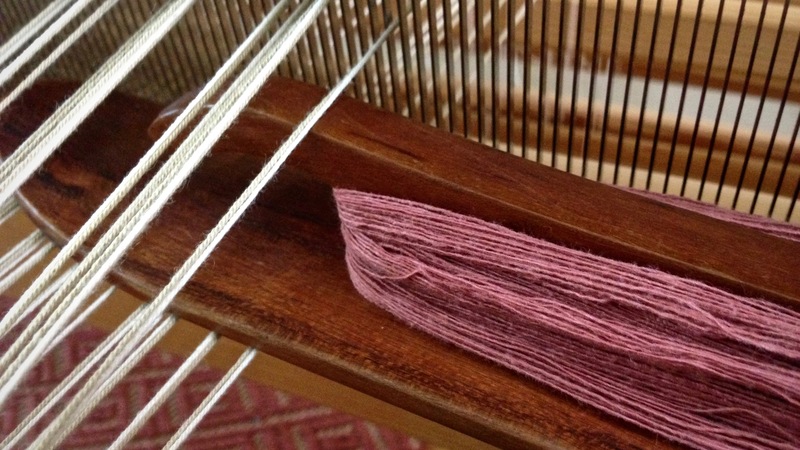 There is something about the beautiful loom…I want to keep it uncluttered. Again, that’s just me. I know many wonderfully skilled weavers who do it differently. Thank you, Karen. I appreciate you replying. I ended up just using the outermost thread as a FS each time I used treadle 2. On treadles 1, 3, 4, the outermost thread was caught up in the pattern anyway so I ended up with really good selveges and less fuss. I’m too new to know what the difference between weaving styles is, so I guess I have a lot to learn. Thanks again! It sounds like you came up with the perfect solution. Way to go! That’s the best way to learn. God surely answers prayer! I am a new weaver who struggles with selvedges. I recently started a simple twill pattern scarf for my husband using black handspun alpaca for the warp and medium grey handspun Shetland for the weft. I have a floating selvedge in place, but I was so unhappy with the definition of the lighter Shetland weft against the black warp. Then, I read Martha’s tip! I am a fisherwoman and like the idea of using fishing line to improve selvedges. I’m going to give it a try! Thanks Martha and Karen! Sounds like it will be a gorgeous scarf!